We have been blessed with healthy, chubby twin girls. Therefore, it seemed like a natural choice to dress them as Cabbage Patch Dolls for Halloween as they bear such a likeness to the famous toy. 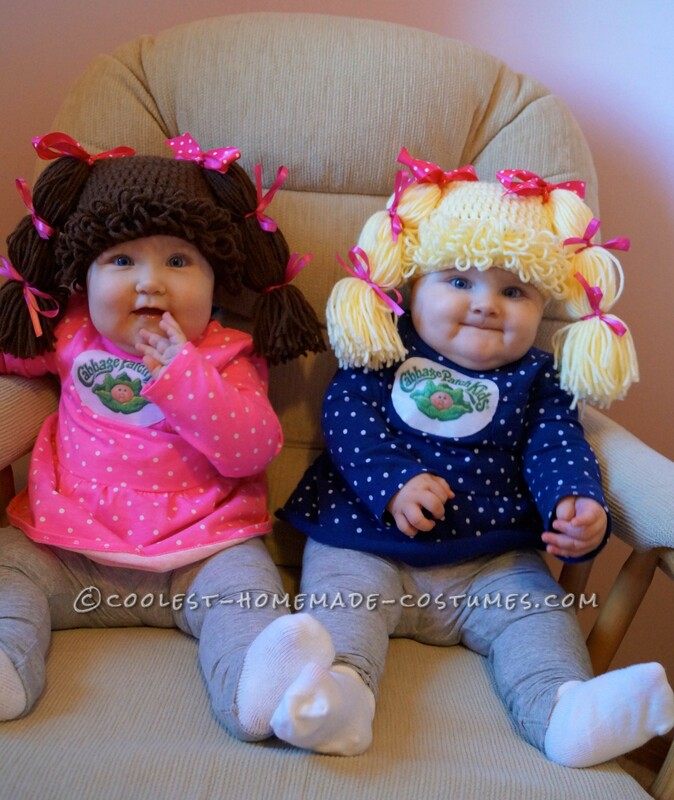 My talented mother crocheted the wigs to which I added ribbon bows and I stitched Cabbage Patch Kids emblems to outfits that we already had in their closet to complete the look. We attended a local Trek or Trot fun run last weekend and I knew that we had a special costume with all of the positive feedback we received from friends and strangers, alike! A woman told me that one of the babies looked just like Fanny Mae, the Cabbage Patch doll that she had as a little girl! The costume maker sewed ready-made cabbage patch emblems onto the polka dot tops. If you can’t find ready-made sew on logos, you can get these Cabbage Patch Iron On Logos on eBay. To create sew-on emblems, first cut out an ellipse shape on paper in a size big enough to accommodate the iron-on logo. Pin the pattern on stiffer fabric like white denim or muslin and cut out. Iron the cabbage patch logo onto the fabric shape you just cut out. If you have a serging machine or or sewing machine that can do an edge stitch, stitch around the outside of the emblem with white thread to create a tidy, professional edge. Pin the emblem on the shirt where you’d like it to be and then sew it on by hand or machine. Alternatively, you can iron double-sided fusible web on the back of your emblem, trim and then place the emblem where you want it and iron it on your shirt. Where could I get one?